What's happening in and around Virginia Beach, VA!! 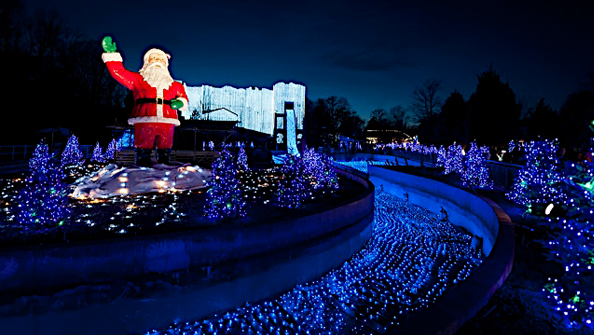 Be sure to check out our new web page on Christmas Town at Busch Gardens Williamsburg. I've seen a lot of great Facebook posts and pictures from friends back home who have visited the park to get into the spirit of Christmas. It makes me homesick and I sure wish I had the gumption to drive back home and visit some of the holiday attractions and events going on. If you're in the Virginia Beach area, this is definitely something fun to add to your holiday agenda. 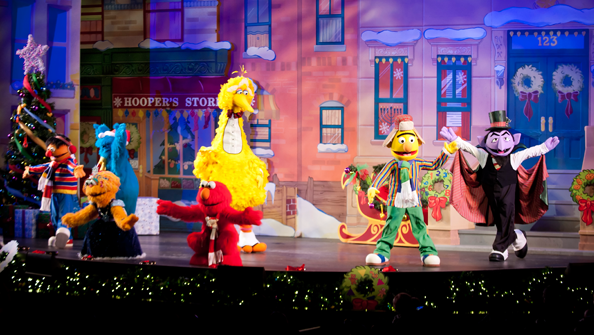 PS: We would love to see more pictures of all of the festivities at the Virginia Busch Gardens! 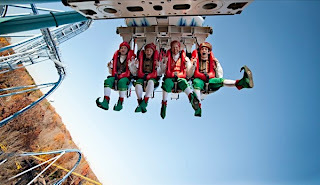 Feel free to send us some of your best shots and we'll post them on our Virginia Beach Attractions Facebook page. Norfolk is welcoming a couple new residents that are a little on the wild side. Two new Malayan Tigers will be settled in the next several weeks and making the Virginia Zoological Park their new home. 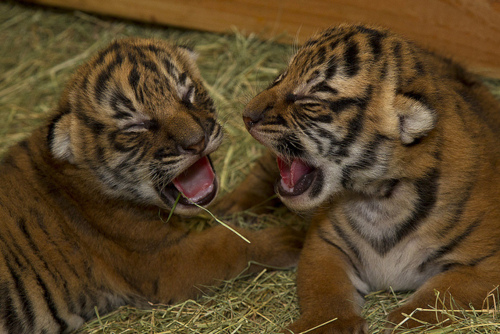 The current residents, Kadan and Tahan, will be re-homed to the Naples Zoo in Florida. Christopher, the youngest tiger coming to Norfolk, currently resides in San Diego. He'll be paired off with a lovely two year old female, Clairborne, from the Bronx Zoo in New York. 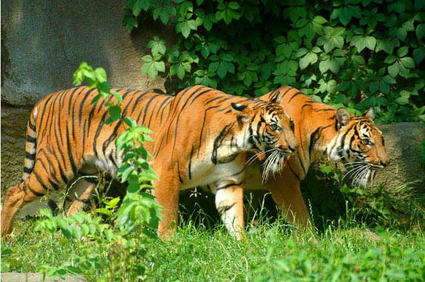 There are less than 600 Malayan tigers left in the wild. The Virginia Zoo partners with other facilities across the nation, and around the world, to establish successful breeding programs for endangered animals like Malayan tigers. Christopher, Clairborne, Kadan and Tahan are not only the happy results of these conservation efforts, they are the future of the program as well. The picture above shows Christopher (on the left) when he was just a cub! He is now one year old and has grown quite a bit since this baby picture. Plan a trip to the zoo to welcome both Christopher and Clairborne to the neighborhood!! Busch Gardens Williamsburg just wrapped up it's annual Howl-O-Scream celebration and now they're preparing for Christmas! Discover the magic of a Colonial Christmas as Busch Gardens Williamsburg transforms the world's most beautiful amusement park into winter wonderland with more than six million Christmas lights, a festive Mistletoe Market and a variety of live holiday performances. 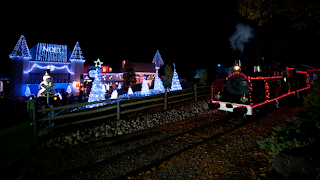 Bundle up and climb aboard Jingle Junction. This 20 minute train ride lets you sit back and take in the all of park's Christmas magic. It's also a great way to get from one end of the park to the other. Reindeer Run, Peppermint Twist, Snowman Summit... there are plans to have up to 22 rides running as long as weather permits. Mach Tower, the parks tallest thrill ride, is transformed by Santa's magic in to Nacht Tower. 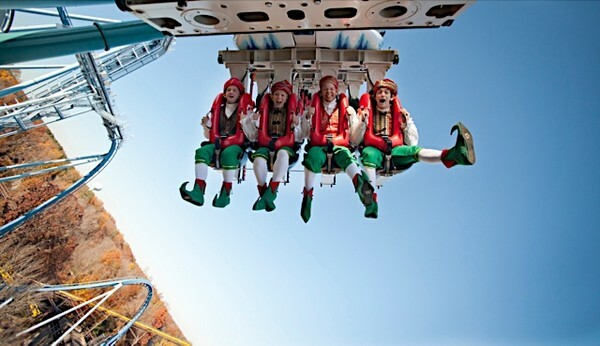 Guests take a leisurely ascent to 240 ft above Oktoberfest. The views at night will be stunning. Then, instead of the Mach Tower's normal hair-raising, white-knuckled, free-fall drop... Nacht Tower will gently lower riders back to the ground allowing guests plenty of time take in all of the festive scenery. Five Christmas productions will be presented including A Sesame Street Christmas, where the characters present a Christmas message about sharing and caring with friends and family members. Get your hat, gloves and scarf out! Pack the family into the mini-van and head to Christmas Town! The amusement park is just 45 minutes from the rest of the Virginia Beach tourist attractions and well worth the short drive. Celebrations begin November 23rd and run through December 31st. The park opens at 3 pm and ticket prices are $27.00 for 3 years and older. The Christmas Town Calender has the days and hours the park will be open so you can schedule your visit. The Virginian-Pilot reported that the city of Virginia Beach is discreetly pursuing a professional NBA team. Early in the summer, there were rumors that the city might be considering a 20,000 seat arena to re-home the Sacramento Kings, but all rumors stopped regarding that particular franchise and there hasn't been much word on that since. The mayor plans to update city council this coming week but won't confirm if they are still in negotiations with the Sacramento Kings or another team. Bringing the NBA to Hampton Roads would be a big boon for the city. An economic impact report shows a professional sports venue could bring in 11 million each year in new taxes and create 3700 jobs. The city is used to hosting popular sporting events like the East Coast Surfing Championships and the North American Sand Soccer Championship, but there is a lot that goes into planning a venue that hosts 20,000 screaming fans! We'll keep you posted. We would love to add a page on professional sporting events in Virginia Beach to the website. Getting the community excited about a professional team trickles down to increased sports participation starting at the elementary school level. It would energize kids of all ages and have a positive impact on the entire community. 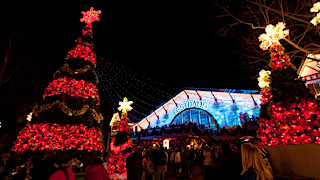 The Virginia Beach Christmas Market is the perfect way to get in the spirit for the holidays. The event will run from November 23rd-25th and be hosted at the Virginia Beach Convention Center. Over 250 artists, craftsmen, jewelers and photographers display their wares at the event! There will be clothing, scarves, artwork, holiday jewelry and more. Shop for one of a kind Christmas Collectables, ornaments or holiday centerpieces. Admission is $7 for Adults; $2 for Children 6-12; Under 6 are Free - One admission covers all three days. If you bring a canned good to donate to the Foodbank of Southeastern Virginia, you'll get .50 cents off the price of admission. The Christmas Market is just one more of the fun local events in Virginia Beach. Over 60 feet long, Megalodon was the largest shark to ever live. This fierce predator ruled the oceans more than 1.5 million years ago and had no problem dining on great white sharks and large whales. Megalodon: Largest Shark that Ever Lived will be on display beginning November 10th at the Virginia Beach Aquarium. Visitors will walk right into the replicated jaws of Megalodon and explore the history of a enormous shark that once dominated the waters around the world. This traveling exhibit will run through February 17th and it's free with your paid admission. The Virginia Aquarium and Marine Science Center is open daily from 9am to 5pm. Admission is $15.00 for children 3-11 and $21.00 for 12 years and older. Seniors save $1.00 off the price of admission. There are so many things to do in Virginia Beach! The Marine Science Center is just one of them. East Coast beach chick. Raised in Virginia Beach, now living in and around Little River, North Myrtle Beach, Virginia Beach and Charleston. Catch me if you can... Conservative with wild Liberal streak.